Tanya Field’s organization, The BLK Projek, has turned an old school bus into a veggie mobile market and is in the process of turning an abandoned plot of land into a farm. Ms. Fields said that she keeps prices low — $3 for a dozen organic eggs, $1.50 for a pound of onions, $1 for a pound of turnips — and accepts food stamps along with cash and credit cards. In recent weeks, she has given away much of the produce to attract customers, and simply to help feed those who say they cannot spare even a dollar. When Fields moved to the South Bronx she was a young mother finishing college. She imagined her near future would include a good job and moving out of the area, which she held many preconceived notions about. Mainly: it’s crime-ridden, dirty and polluted, she says. Six months later she was laid off from her job and had to go on welfare. She was also pregnant again and in a destructive relationship. When her second child was born with chronic asthma her hopelessness reached a breaking point. Where she ultimately found solace surprised even her. She could turn her hopelessness into action fighting for environmental justice. Field’s first program with the BLK Projek, Holistic Hood, included workshops on food justice issues (along with healthy snacks). Then she started guerrilla gardening in abandoned lots, and “getting kicked out of places and getting in trouble with the police,” she says. While looking for a more permanent space for her farming dreams, she came across an old school bus and grew acquainted with a farmer in upstate New York. 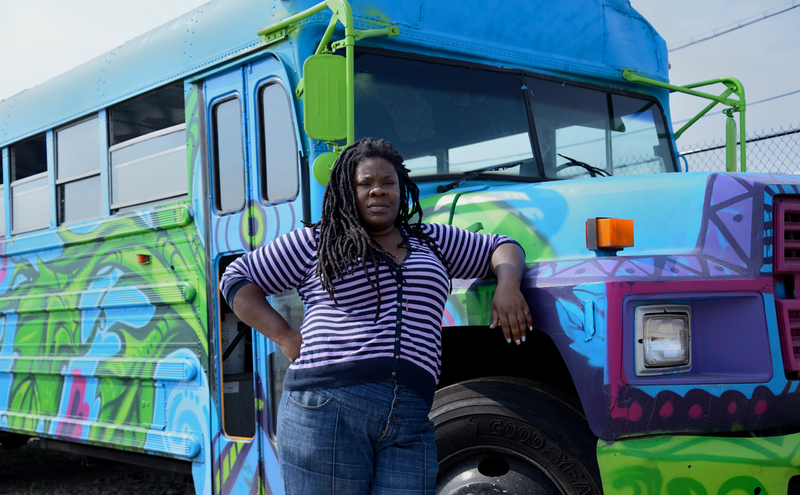 She’s currently in the process of outfitting the bus with refrigeration units to use it as a mobile vegetable market where South Bronx residents can buy produce from upstate farms. And her farming dreams seem to be coming to fruition. She has recently been granted approval from the city to farm in a 4,300-square-foot, long-abandoned lot in the neighborhood. The space used to be a community garden in the ’80s and ’90s, and she’ll begin cover cropping and building raised beds at Libertad Urban Farm, as she’s named it, in November. She plans to sell the produce she grows here at the Mobile Market. Fields hopes the farm and market can become a job creator as well as a way to revitalize the area. Neighbors are already excited for the farming to begin. As she surveyed the lot recently a neighbor came over to see how things were progressing. Right now the space is overrun and trash-strewn but “they remember when it was a beautiful garden,” says Fields. And someday soon, if Fields has anything to say about it, it will be again. ← “Ashley Yong knew her dad wasn’t going to pay for prom, so she started saving money. But when it finally came time to prepare for the big night, the high school student didn’t spend the money she saved on the perfect dress or even a prom ticket. Instead, she used it to make a much longer lasting impact. The 17-year-old from Darien, Ill., skipped her senior prom to help homeless people in her community. She spent the money she saved for the dance on items like socks, toothbrushes and food and packed them into 20 boxes. Then, she personally delivered them.” So beautiful.